I love this book. Louden weaves stories about her own life and journey into a book of journal prompts for connecting to Self. She emphasizes “living the questions” over finding the answers. 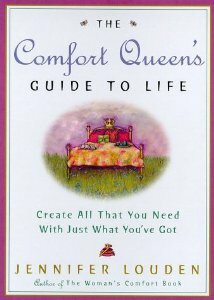 The first prompt I picked from the book was, “What do I really need right now?”. The answers turned out to be simple, but asking the question shifted me from being tuned out to being tuned in. I hadn’t been ignoring some major suppressed calling. I just had been ignoring myself. I had been tuned to the “outside myself” station instead of the “inward” station. After writing for awhile, I felt that surge of energy I get when I reconnect to myself. The message in this book is that the content of the answer doesn’t matter as much as the spirit in which you ask and listen. It’s not about getting the answer, setting some goals, and making a plan to solve all your problems. It’s about asking the question and listening each day for new answers. It’s about staying in touch with the deepest part of ourselves on a regular basis. It reminded me that my Self is a mystery to explore, not a puzzle to solve. The answers may change from day to day, but only by continuing to ask will I be in connection with my own aliveness.